This is a spectacular cake. You should make it, right now, and you should eat it right out of the oven, when it's hot and the gooey caramel top is dripping all over the cake. You should probably also put whipped cream on it. This is the kind of cake that we rarely make. We're usually doing something with frosting or something with fruit (or something with both), and tend to forget about the simple deliciousness that happens when sugar is mixed with cream and butter and turned into caramel. This is a pretty standard upside-down cake, but with no fruit, and I have to admit it was hard to resist the temptation to add something to it (but what if we put raspberries in the cake? Or added some sliced apples to the topping? ), but I am so glad that we did, because it's perfect and simple and beautiful as it is. There's a very moist, buttery cake made with almond flour, cooked with a layer of caramel in the bottom of the pan. 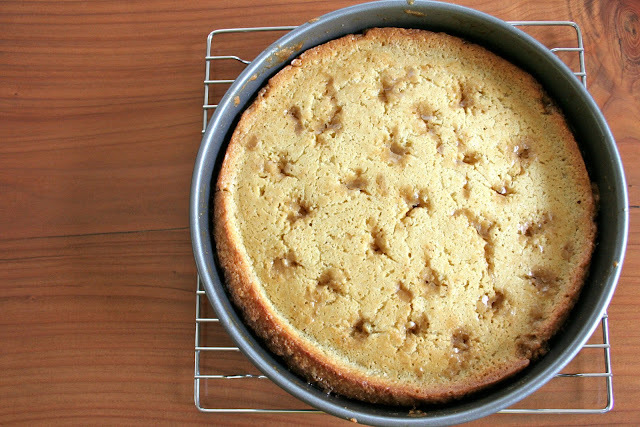 As the cake bakes, the caramel boils and bubbles up the sides of the pan, coating the cake. Some of the sugar topping bakes into the cake, making a sweet, sticky cake layer, and then some gooey caramel stays separate and oozes over the sides when you turn the cake out. Some of our caramel stuck in the pan - make sure you scrape that out with a spatula and drizzle it over the cake. This is another recipe from Karen DeMasco's The Craft of Baking, and we made very few changes to it. 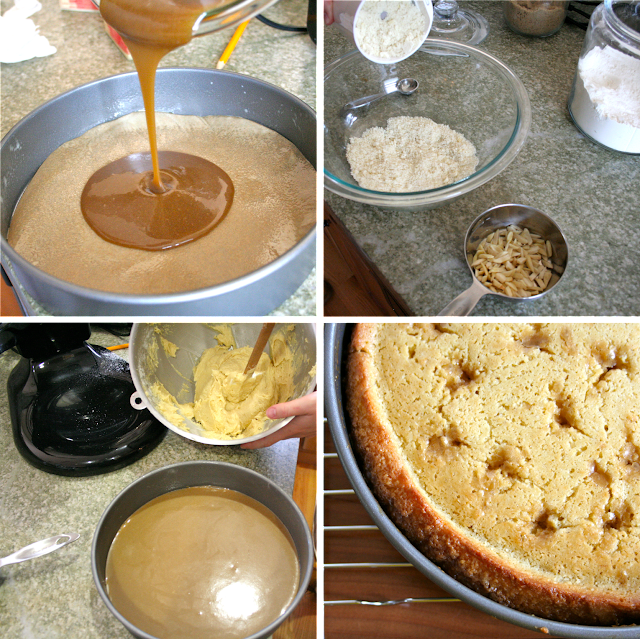 We cut out some of the sugar in the cake (we figured there would be enough sweetness with the caramel on top). We accidentally added a bit of extra almond flour because I apparently have trouble reading recipes, but it turned out perfectly so we're leaving it that way here. In the recipe, she instructs you to reserve some of the caramel topping, and about halfway through the baking, to take the cake out and drop teaspoons of it scattered throughout the batter. We did that (those are the dimples that you see in the picture of the whole cake) but are leaving it out of the instructions here because we didn't think it was worth it - you get plenty of caramel from the top in every bite, and we didn't even notice the caramel in the bottom. So we decreased the caramel recipe to have enough just for the topping (don't worry - it's enough). There was also a little debate about how to serve it - the sensible one of us felt that whipped cream would be overkill with such a rich cake. The gluttonous one of us felt that we might as well go all out. What do you think? Cut out a piece of parchment paper to fit your cake pan. Butter the bottom and sides of the cake pan, and put the parchment in the bottom (strange as it may sound, you actually do want to butter under the parchment so that the paper sticks to the bottom of the pan; this will make it easier for you when you're trying to spread the thick batter over the caramel without moving the paper all around). Preheat the oven to 350 degrees. For the cake, first make almond flour (you could also buy it, but when we saw that it was $10 a bag we decided to try doing it ourselves, and were surprised at how easy it was). Grind the almonds with 1 tbsp of the flour until you get a coarse meal. The book suggests using a food processor, but we used our coffee/spice grinder, working in small batches (1/4 cup of almonds and 1 tsp of flour each time), and it worked brilliantly. Sift together the almond and regular flour with the baking powder and salt into a medium bowl. Combine the butter, sugar, and vanilla with a hand mixer or using the paddle attachment of a stand mixer. Beat until smooth and well combined - about two minutes. Add the eggs one at a time, blending well. Scrape down the sides of your bowl and blend again as needed. In two additions, beat the flour mixture into the wet mixture, using a low speed. When the batter is just combined, pour it into the pan over the caramel (the batter will be on the thick side), and spread it out as evenly as possible. Put the cake in the oven and bake until it's golden brown and firm on top (about 45 minutes). Remove from the oven, turn the cake onto a plate, and serve it immediately. It really is best hot from the oven, since the caramel will be all gooey, but if you don't plan to eat it immediately you can reheat it for 5 minutes in a hot (350 degree) oven. Serve with whipped cream, if you want to go the gluttonous route.